When Saint Luke’s Home, Cork relocated in 1994 from Military Hill to Mahon in the south suburbs of Cork City it was a 90 bed care home and a small chapel was consecrated at the time by the Right Reverend Roy Warke, Bishop of Cork. In 2000 a day-care facility was added and a fourth unit (30 additional beds) was opened in 2004. 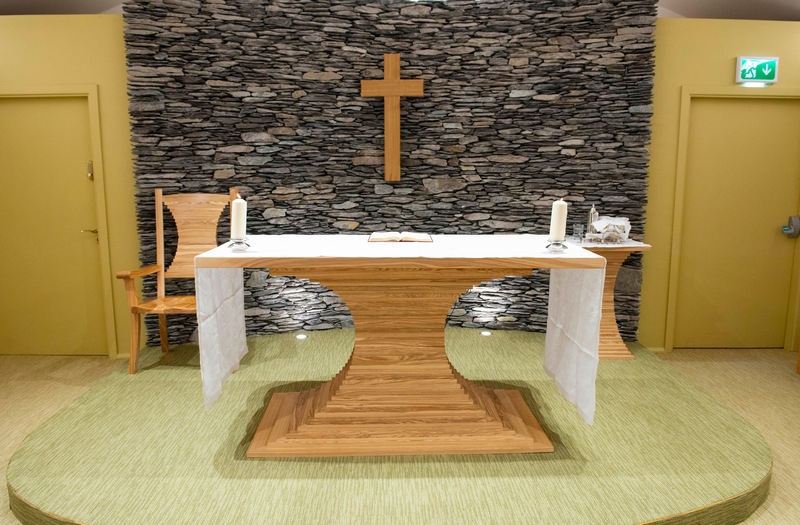 The chapel was extended to take in an adjoining room, and the chapel was realigned. Major refurbishment and upgrading work was completed on the original units in 2005 and, three years later the main corridors and dining room were upgraded, and the kitchen was extended. In 2011 the Education and Research Centre at Northridge House was opened. All in all, the original chapel was proving too small for the greatly enlarged facility and when, in 2017 the Fire Officer required alterations to the ceiling it was decided to extend and redevelop the original chapel space and completely to renew it. The Service of Dedication of Memorial Gifts and Consecration took place on Friday, 7th September in the presence of the management of the Charity, the directors, representatives of the residents and staff, the people who worked on the project, the architect, the chaplaincy team, and donors of the principal items of furniture. 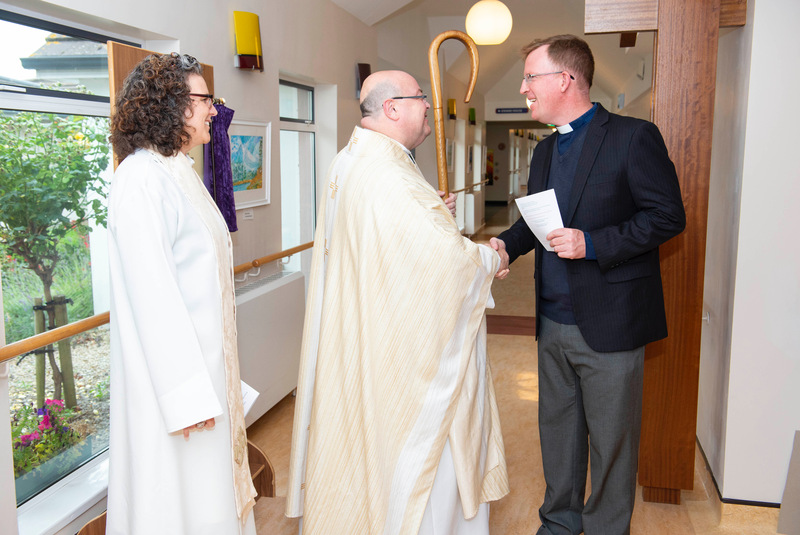 The Bishop of Cork, the Right Reverend Dr Paul Colton, presided at the liturgy, in the course of which he congratulated the charity, thanked donors, and paid tribute to the ministry and creativity of the Reverend Sarah Marry, Chaplain to the Home, for all her work on the Chapel project. On Saturday 8th September there was an open day for all residents and donors. The chaplain of the Charity, the Reverend Sarah Marry, and the Bishop, were on hand throughout the day to conduct memorial prayers. The first use of the Chapel for residents was a celebration of Mass for Roman Catholic residents that afternoon. Bishop Colton returned to celebrate the Eucharist for residents at the usual Sunday Service on Sunday, 9th September. The Reverend Sarah Marry and the Bishop greet the Methodist Minister, the Reverend Andrew Robinson. We had a wonderful weekend at the Home and, in its wake, I wish to take the opportunity, with two hats on – as chairperson and as bishop – to thank the directors of the charity for running with and providing the funds for the chapel expansion and redevelopment, to thank management for overseeing it, to thank staff and residents for their patience throughout the project, to thank all who worked on it for what they have achieved, to thank all the donors who responded to the appeal I sent out, and, especially, to thank the Reverend Sarah Marry and everyone she drew in to the design and reflection about this project. It is worth explaining some of the thinking behind the Chapel design. Naturally there were practical considerations. Height was very important – the extension in the height gives more of a recognisable ecclesiastical space and the physical space even encourages all to have higher thoughts. Optimising the existing room and extending it wherever possible was vital. A space that would be identifiably a place for Christian worship while allowing, at the same time, scope for anyone of any outlook to come and go, and be still and private (hence the niche seating areas). Light, hearing, heat, air and webcam were all part of the practical considerations, and, of course, the motivation of it all – fire safety and well-being. The design evolved from reflecting on God as the creator – earth, air, fire and water: the elements – providing the colour scheme devised by the Reverend Sarah Marry. 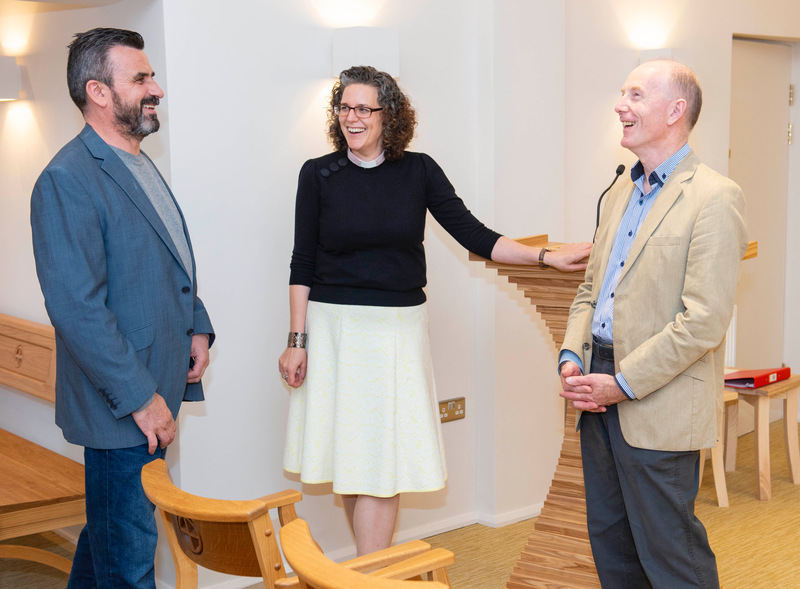 The pale and empty walls allow for a key principle; it is the people who come in to the church and use it – the people of God – who provide the colour, the personality, the humanity – the Church. 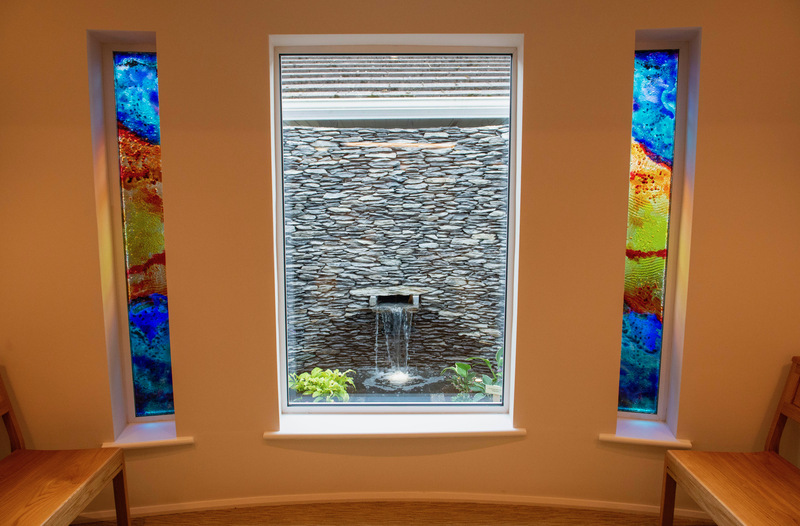 The new stained glass windows (also a gift) by Eoin Turner, which pick up themes and shapes of the old stained glass, reflect the themes of earth, air, fire and water. All the new furnishings were gifts. 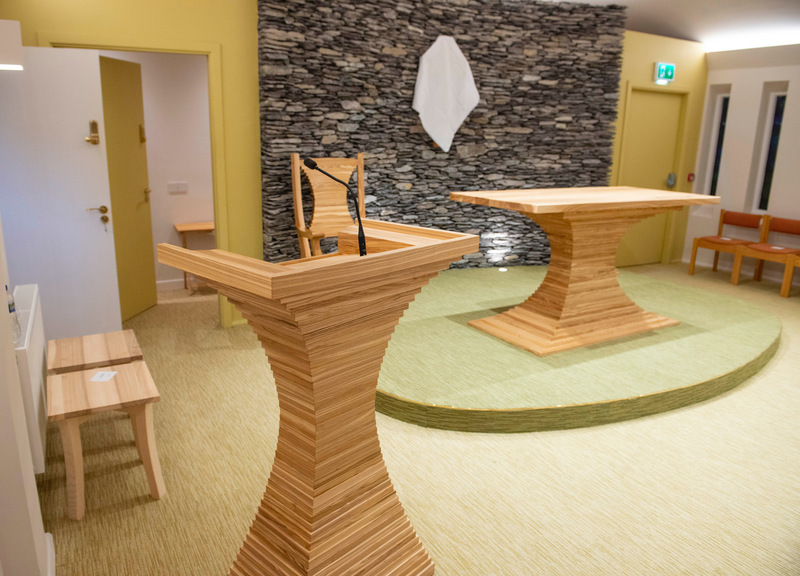 The chairs and benches were made by ICS (who also made the chair for the Pope’s recent visit to Knock). The lectern, credence table, presiding minister’s chair, and communion table were all memorial gifts and were made by Anthony Aylward. 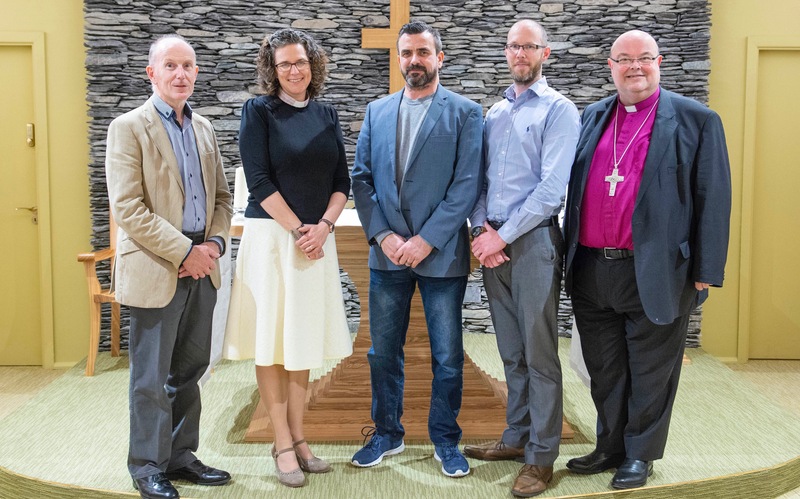 Individual donors as well as parishes from throughout Cork, Cloyne and Ross responded to an appeal for funding for the chapel furnishings. Among everything three dominant items, in many ways are (i) the stone reredos’ – one behind the altar, and a second out in the garden (which doubles as a way to conceal the glass corridor behind; (ii) the altar itself and (iii) the water feature. Taken together, the water and the table remind us of the two sacraments given to us by Jesus himself – baptism and Holy Communion- or dominical sacraments as we call them. faith in Christ – the solid rock on which we build (and our faith is built);’You are Peter (stone) and on this rock (faith) I will build my church. The prophetic image of Jesus Christ in Isaiah as ‘the shadow of a great rock in a weary land’ – the one provides shelter, and shape of the stone reflects the outstretched embracing and sheltering arms of Jesus on the cross. This is repeated in the water feature (linking the two sacraments), and it goes further. Given as a memorial gift it recalls that episode in Exodus when the children of Israel, having being led out of slavery in Egypt, by Moses, and through his leadership had escaped their near miss experience at the Red Sea, nonetheless, began to complain. They were tired wandering in the desert and were really struggling. God told Moses to strike the rock, and out from it came water to refresh them, and to sustain them. 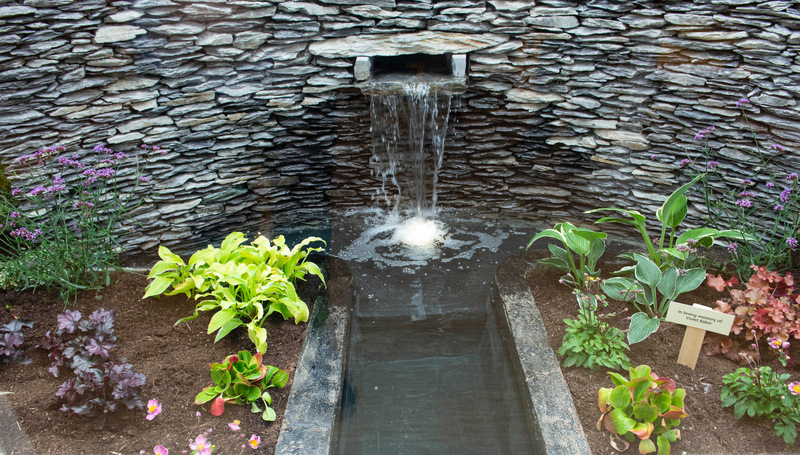 When the donor brought his brother to see the water feature (given in memory of their mother) on Saturday he was very moved and he said ‘do you know’ he said, that’s exactly like our mother’s home place in West Cork. They had no water inside growing up and got all their water from an outside well – and it had a step exactly like that with the water coming out higher up.’ Serendipity! This entry was posted in Bishop, Care of the Older Person, Chaplaincies, Charities in the Diocese, Church in Society, Church Services, Dedication, Diocese, Five Marks of Mission, Gifts to the Church, Liturgy, Northridge House Education and Research Centre, Official Opening, Saint Luke's Charity, Saint Luke's Home, Special Events, Voluntary Work. Bookmark the permalink.